July 18, 1918: Rolihlahla Mandela is born into the Madiba clan in Mvezo, Transkei, South Africa, to Nonqaphi Nosekeni and Nkosi Mphakanyiswa Gadla Mandela, principal counsellor to the Acting King of the Thembu people, Jongintaba Dalindyebo. 1925: Attends primary school near Qunu. His teacher Miss Mdingane gives him the name Nelson, in accordance with the custom to give all school children “Christian” names. 1927: Entrusted to Thembu Regent Jongintaba Dalindyebo. 1934: Undergoes initiation; Attends Clarkebury Boarding Institute in Engcobo. 1937: Attends Healdtown, the Wesleyan College at Fort Beaufort. 1939: Enrolls at the University College of Fort Hare, in Alice. 1940: Expelled from University College of Fort Hare. 1941: Escapes an arranged marriage; becomes a mine night watch man; Starts writing articles at the law firm Witkin, Sidelsky & Eidelman. 1942: Completes BA at the University of South Africa (UNISA). Begins to attend African National Congress (ANC) meetings informally. 1943: Graduates with BA from Fort Hare; Enrols for an LLB at Witwatersrand University. 1944: Joins African National Congress. Co-founds the ANC Youth League (ANCYL). Marries Evelyn Ntoko Mase – they have four children: Thembekile (1945); Makaziwe (1947 – who dies after nine months); Makgatho (1950); Makaziwe (1954). 1948: Elected national secretary of the ANCYL. Engages in resistance against the ruling National Party’s apartheid policies. By his own admission he leaves the University of the Witwatersrand without graduating. 1951: Elected President of the ANCYL. 1952: Defiance Campaign begins; Arrested and charged for violating the Suppression of Communism Act; Elected Transvaal ANC President; Convicted with J.S Moroka, Walter Sisulu and 17 others under the Suppression of Communism Act; Sentenced to nine months imprisonment with hard labour, suspended for two years; Elected first of ANC deputy presidents; Opens South Africa’s first black law firm with Oliver Tambo. 1953: Devises the M-Plan for the ANC’s future underground operations. 1955: Watches as the Congress of the People at Kliptown launches the Freedom Charter. 1956: Arrested and joins 155 others on trial for Treason. All are acquitted by 29 March 1961. 1958: Divorces Evelyn Mase; Marries Nomzamo Winnie Madikizela – they have two daughters: Zenani (1959) and Zindzi (1960). March 21, 1960: Sharpeville Massacre. March 30, 1960: A State of Emergency is imposed. Mandela is among thousands detained. April 8, 1960: The ANC is banned. March 29, 1961: Is acquitted of treason. 1961: Goes underground; Umkhonto weSizwe (M(Spear of the Nation) s formed. January 11, 1962: Leaves the country using pseudonym, David Motsamayi. Travels around Africa, visits England to garner support for the ANC. Receives military training in Morocco and Ethiopia. July 1962: Returns to South Africa. August 5, 1962: Arrested near Howick in KwaZulu-Natal. November 7, 1962: Sentenced to five years in prison with hard labor for incitement and leaving the country without a passport. May 27, 1963: Sent to Robben Island. June 12, 1963: Returned to Pretoria Local Prison. VIDEO: Nelson Mandela’s Court Statement in 1964 before he goes to prison. December 3, 1963: Pleads not guilty to sabotage in what becomes known as the Rivonia Trial. June 11, 1964: All except Rusty Bernstein and James Kantor are convicted and sentenced (June 12) to life. 1968: Nelson Mandela’s mother dies. He’s not allowed to attend the funeral. July 13, 1969: His oldest son, Thembekile is killed in a car accident. He’s not allowed to attend the funeral. March 31, 1982: Mr. Mandela, Sisulu, Raymond Mhlaba and Andrew Mlangeni and later Ahmed Kathrada are sent to Pollsmoor Prison. 1985: Rejects South African President PW Botha’s offer to release him if he renounces violence. November 3, 1985: Has prostate surgery. August 12, 1988: Admitted to Tygerberg Hospital and is diagnosed with Tuberculosis. August 31, 1988: Admitted to Constantiaberg MediClinic. December 7, 1988: Moved to Victor Verster Prison in Paarl where he was held for 14 months in a cottage. 1989: He obtains an LLB through the University of South Africa while in prison. He graduates in absentia at a ceremony in Cape Town. February 2, 1990: ANC is unbanned. February 11, 1990: Released from prison. March 2, 1990: Elected ANC Deputy President. April 16, 1990: Nelson Mandela gives a speech at the Wembley stadium, two months after he is released from Prison. December 10, 1993: Awarded the Nobel Peace Prize with FW de Klerk. April 27, 1994: Votes for the first time in his life. May 9, 1994: Elected by Parliament as first president of a democratic South Africa. May 10, 1994: Inaugurated as President of the Republic of South Africa. December 14, 1994: Starts writing his autobiography Long Walk to Freedom. 1995: Establishes the Nelson Mandela Children’s Fund. July 18, 1998: Marries Graça Machel on his 80th birthday. 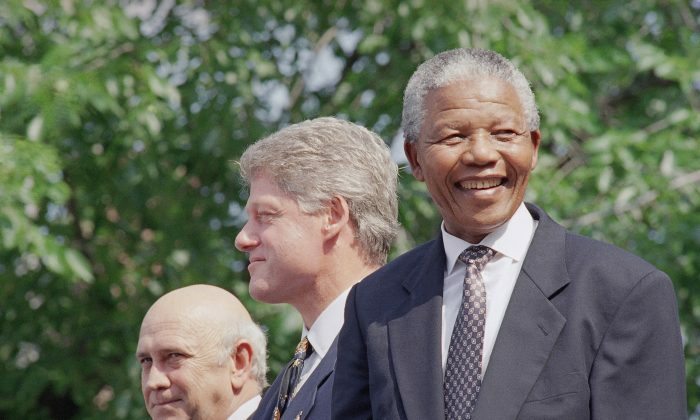 1999: Steps down after one term as President, establishes the Nelson Mandela Foundation. 2001: Diagnosed with prostate cancer. 2003: Establishes the Mandela Rhodes Foundation. June 1, 2004: Announces that he will be stepping down from public life. January 6, 2005: Announces that his eldest son Makgatho had died of AIDS. 2007: Witnesses the appointment of his grandson Mandla as chief of the Mvezo Traditional Council. July 18, 2008: Turns 90 years old, asks future generations to continue the fight for social justice. 2009: Votes for the fourth time in his life. Attends the inauguration of President Jacob Zuma on May 9 and witnesses Zuma’s first State of the Nation address. 2010: Is formally presented with the FIFA World Cup trophy before it embarks on a tour of South Africa. June 11, 2010: His great-granddaughter Zenani is killed in a car accident. June 17, 2010: Attends the funeral of his great-granddaughter Zenani. July 11, 2010: Makes a surprise appearance at the Final of the Fifa World Cup in Soweto. July 2010: Celebrates his 92nd birthday at home in Johannesburg with family and friends. October 2010: His second book Conversations with Myself is published. November 18, 2010: Meets the South African and American football teams that played in the Mandela Challenge match. January 2011: Is admitted to hospital in Johannesburg where he was diagnosed with a chest infection. He is discharged after two nights. May 16, 2011: Votes in the local government elections. June 2011: His book Nelson Mandela By Himself: The Authorised Book of Quotations is published. June 21, 2011: Is visited at home by American First Lady Michelle Obama and her daughters Sasha and Malia. July 18, 2011: Celebrates his 93rd birthday with his family in Qunu, Eastern Cape. October 21, 2011: Is officially counted in South Africa’s Census 2011. December 2011: Spends Christmas with family in Qunu. February 25, 2012: Admitted to hospital for abdominal complaint. Discharged after one night. July 18, 2012: Celebrates his 94th birthday with his family in Qunu, Eastern Cape. December 8, 2012: Is admitted to hospital. December 26, 2012: Is discharged from hospital. January 1, 2013: Spends New Year’s Day with members of his family in Johannesburg. March 9–10, 2013: In hospital. March 27 to April 6, 2013: In hospital. June 8, 2013: Admitted to hospital. September 1, 2013: Discharged from hospital, but still in poor health. December 5, 2013: Mandela passes away at age 95.